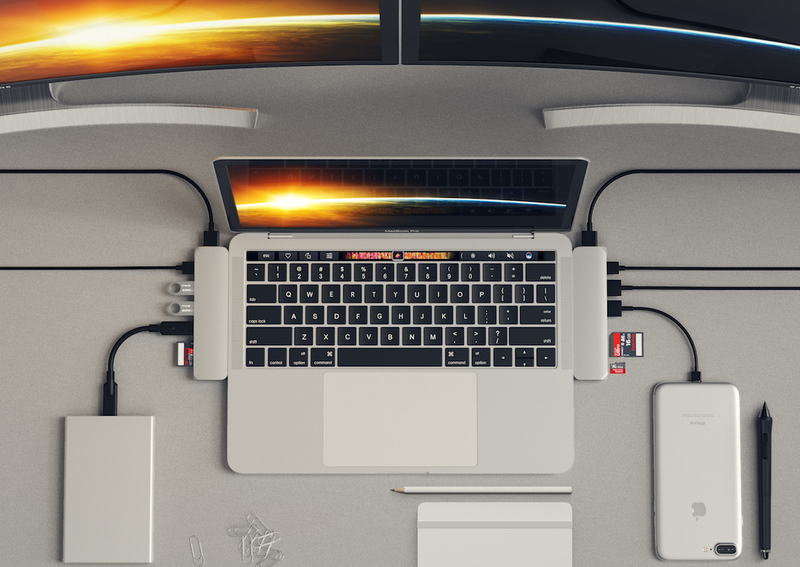 Accessory manufacturer Satechi today launched a new $99.99 Type-C Pro Hub for the 13-inch and 15-inch 2016 MacBook Pros, featuring a total of seven ports to make up for the inclusion of only Thunderbolt 3/USB-C ports on the 2016 MacBook Pro. The new hub is similar in design to the Type-C Hub compatible with Apple's original 12-inch Macbook, but includes two Thunderbolt 3 dongles that take up both ports on either side of the new MacBook Pros with Touch Bar. The hub is compatible with the non-Touch Bar MacBook Pro as well. 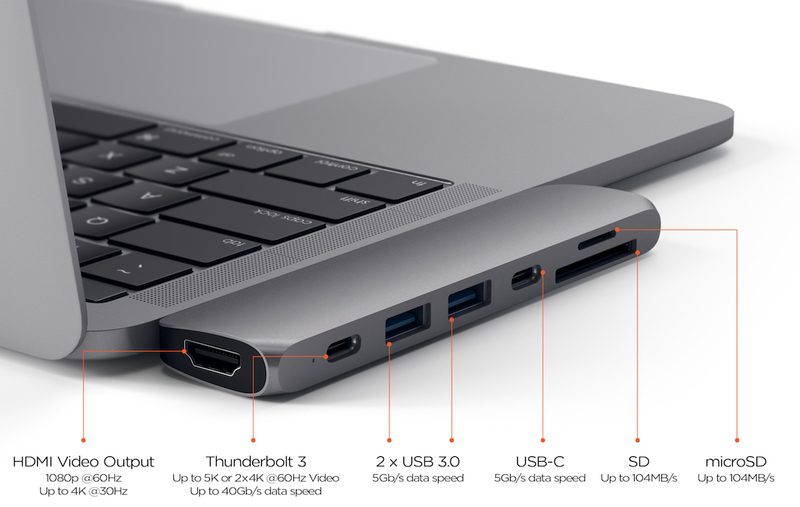 After users plug the hub in, they can gain access to a passthrough Thunderbolt 3 port, a USB-C port, and the following ports missing from Apple's device: 4K HDMI, 2 USB 3.0 ports, and both SD and microSD card readers. The Thunderbolt 3 port supports quick data transfer of speeds up to 40Gbps, as well as passthrough charging for both 13-inch (61W) and 15-inch (87W) models of the MacBook Pro. Users can output 1080p video at 60Hz via the HDMI port, and up to 4K video at 30Hz. Both the USB 3.0 and USB-C ports include transfer speeds of up to 5 GB/s, while the photo and video editing capabilities of the SD card slots provide data transfer speeds of up to 104 MB/s. Those interested can purchase the Type-C Pro Hub from Satechi's website for $99.99 starting today. Like the company's other products, the hub comes in MacBook color-matching Silver and Space Gray, and has a brushed aluminum finish to complement Apple's aesthetics. Never been a fan of these all in one hubs that snug right up against the side of the MacBook body. Not only is it being attached via one flimsy USB port, but visually it looks really bulky and unbalanced. It almost seems more appropriate to have a single cable coming out of the USB-C and have the hub attached to that. Correction: connection is via 2 USB ports. Sucker! this is a HyperDrive knockoff AND ITS MORE EXPENSIVE! LOL! Why is MacRumors advertising a knockoff? HyperDrive has been around... These guys just took their idea and repackaged it. You can still get one on Indiegogo from HyperDrive for $79. I have mine in-hand, I got in on the Kickstarter and was delivered months ago for $69. Love it.. It's not meant for the 12" MacBook, but for the Late 2016 MacBook Pro models with two ports. I've been testing it, and my first impression is that it's a real plesasure to use. Was looking through that product page and I saw two display ports, I was sold. Then I came across this: "For Mac customers looking to use dual monitors with an extended desktop this is not currently possible, as MST (Multi Stream Transport) is not supported within the Mac OS." Freaking Apple having to make everything such a PITA. This explains why there are dozens of adapters and docks out there that still don't have the sole function I'm looking for. All I want is a single adapter for multiple displays. I already spent $2500 on this bloody machine I just want the ability to have more than a single screen through a single device. As I suspected, you get 4K HDMI at 30hz, which is awful to work with. The 4K @ 60hz issue is still a big one with these. You have to have a dedicated dongle for it. The problem is, current USB-C hardware can't support 4k@60Hz and USB 3 speeds over a single cable. The USB-C cable has 4 high-speed wire pairs (lanes) capable of carrying USB 3.1 data, plus a spare low-speed pair that can carry "legacy" USB 2.0 data. In DisplayPort mode, either one, two or four of those lanes are physically allocated to DisplayPort data. For low-res displays or 4k@30Hz, one or two lanes are sufficient, leaving two or three lanes free for USB 3.1. Unfortunately, 4k@60Hz requires all 4 lanes for DisplayPort, which just leaves the spare USB 2.0 wires for other peripherals. (AFAIK all USB-C to HDMI adapters use a DisplayPort-to-HDMI converter - there is a native "HDMI alt mode" in the pipeline which takes DisplayPort out of the equation, but I don't think that's currently in play). Thunderbolt 3 is still limited to DP1.2a (insane!) but rather than physically allocating some lanes to DP (DP 1.2a actually wastes almost half the bandwidth of each wire pair), it moshes the DP and PCIe data together so that they can co-exist on the same physical wires and not "waste" bandwidth. This is much more efficient and - combined with the fact that TB3 runs the cable twice as fast as USB-C anyway - means it can easily support 4k@60Hz, and even 5k - although 5k actually uses two 'virtual' DisplayPort cables. The downside is that while DisplayPort-over-USB-C is basically DisplayPort and only needs a simple adapter at the display end, TB3 relies on a full-blown TB3 controller (or dock) at the display end. Still - 4k/5k displays are still bandwidth hogs and if you want to run them alongside a performance-critical high-speed TB3 or USB 3.1 device, I'd strongly advise subjecting yourself to the indignity of plugging two cables into your computer. Shouldn't we all just really be mad at Apple for putting us--the people who pay their bills--through all this unnecessary hassle? Do we still deserve our much needed ports? This is why I won't buy another Apple product until they give us our ports back. It's bad enough having to find a Lightning digital to analog converter to hook up headphones. Why should people pay a premium to connect a non-premium? Digital bouncer won't let our accessories be part of the club anymore. Gotta buy AirPods I guess lol I wonder what other ports and features Apple will magically make vanish? What's left?